Lately I've been feeling kinda blah about running. Not the running itself really, just that its been getting harder to fit it in with everything else. Work has been getting busy as everyone struggles to get stuff done before the holidays. And as it gets darker (and colder) we try to leave early on run days to get our runs in mostly in daylight. It seems like the nights are getting away from me. By the time I run (longer than I had been) get home, make food, eat, clean up, put together something for tomorrow- I'm exhausted and its time for bed. I don't know how people with more responsibilities manage to fit it all in. Last week before every run I would be thinking "I don't want to do this," or "Can't we just do this tomorrow." And after every run I was thinking "Glad that's over,can I go to bed?" Clearly I need some motivation. First I must give big props to my running buddy, who has been making me go on runs even if he didn't want to do them himself. Between the two of us and our grumbles, we've still been hitting every planned run. Also I've joined Daily Mile to track my workouts. Its cool that it gives you totals, allowing people to know how far they've run in a week, month, or year. If we stick to the plan we can top 30 miles this month, and it'll be fun to watch that number tick up. Finally, Saturday's 5k was really awesome for restoring my motivation. Running the whole thing, getting the PR, and finishing strong have all made me think I'm ready to continue my running journey. I'm seeing the hard work pay off and I want to keep building on that. So where does that journey lead? Well, first it leads to a 10k at the Illinois Marathon event. My good friend (former freshman roommate and mortal enemy) Meg lives in Champaign and is running her very first marathon. Another of our former roommates, Debbie, and her hubs Mike are going to run the half marathon and cheer her on. Bf and I are gonna go too, to run the 10k and cheer her on. I'm really excited for her to have this incredible achievement. Maybe one day we can all be marathoners, but for me and Dan that's a long way off. I would like to hit a local 10k before then since our training plan is actually up on 2/18, and because I want to have a test run for my stomach which hasn't been handling 4 mile runs so well lately. After that my true bucket list run is the Disney Marathon, but before I could ever be ready for that, I really want to do the Wine and Dine Half next Fall. They don't have any details posted for next years race yet, so I really hope they have it. I love Orlando and Disney and especially the Food and Wine Festival where you can eat your way around the world! 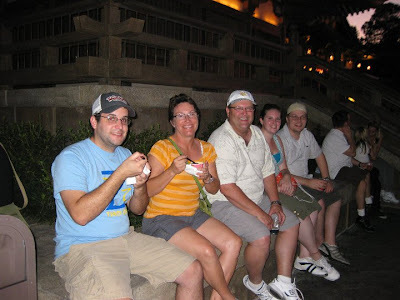 Here is a picture of Dan, my parents, and some college friends as we ate our way around the world in November, 2010 (sadly I was behind the camera for this one). Think of how much more eating you could do after running 13 miles!